This was okay. Bit of a character focus problem, though. Something I realize on thinking back is that Homer's friendship with Harper's dad seems to get more screentime than the friendship between Lisa and Harper, which doesn't get as much focus and kind of makes the conflict between them feel a bit hollow. I can see what they were going for, but it needed to be fleshed out more to work properly. Aside from that, the jokes were good, the "Feast" parody was a wonderful bit of black comedy, and I loved the callback to "The Great Simpsina" with Lisa's interest in magic. Man, Bart was super bratty in this one, but it still pulled a little fun out. 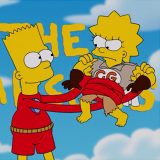 I agree that it was pretty meh, though Lisa felt fleshed out enough and like a real kid. It felt like the show was afraid to cut away from Homer and focus in on it though.